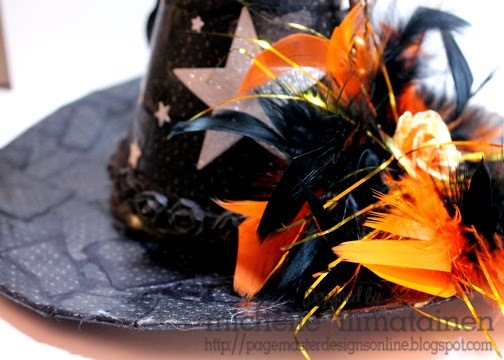 Hello, today I am sharing 3 projects that I created with Tombow products. I had a lot of fun with these. I am a huge Tomobw fan. In fact, the only adhesive I use is my Tombow mono mini dot roller. I love this thing to pieces. 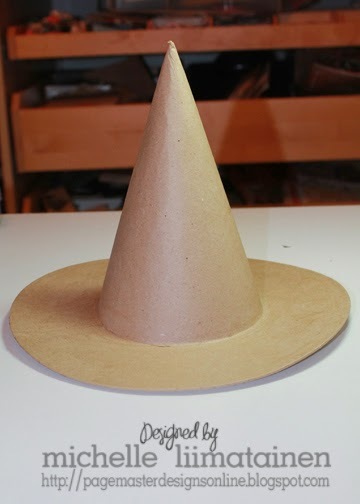 For my first project I have this very fun Witch Hat. I used the Tombow Mono Aqua on this. I wanted to try something other than Modge Podge. While Modge Podge is great for some products I really don't like the tacky feel it leaves. I can say beyond a shadow of a doubt that the Tombow Mono Aqua works PHENOMENAL on these types of products. The finish is AMAZING and there is absolutely NO TACKY FEEL to it. 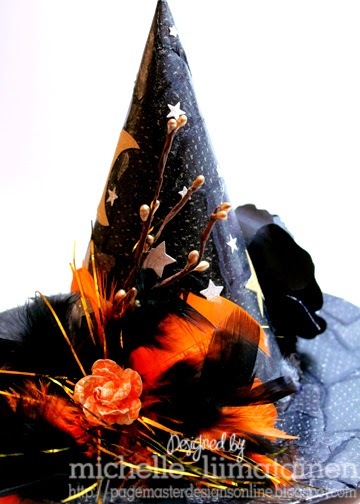 I tore up some Halloween paper that I picked up on clearance as my LSS last year. I tore it up into rectangles and squares and used a marker to cover up the white core. I just used a Sharpie for this part. Acid free didn't really matter as I am not preserving photos. 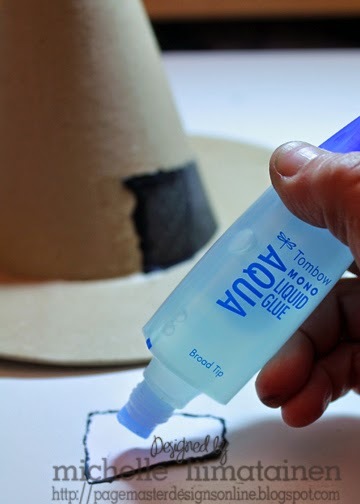 I put some of the Tombow Mono Aqua Glue on the back of the paper and then placed it onto the hat. I used the broad tip for this portion of the project. 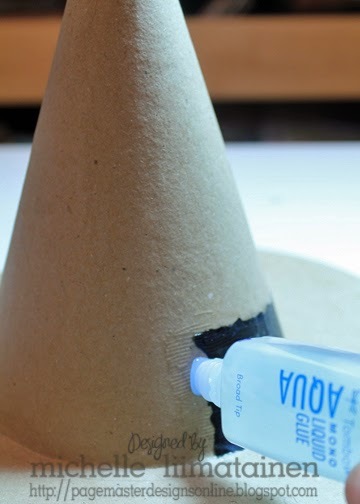 It went super fast and it was really easy to apply it directly to the paper on the hat to seal down the edges firmly. I continued by these same steps until the hat was completely covered. The glue dries pretty fast so there was very little wait time between finishing the application and the decorating. You can see how I overlapped the papers to give it dimension. 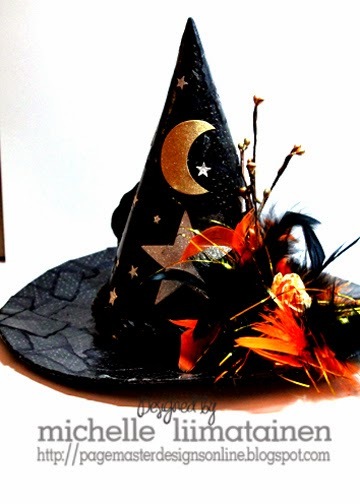 I wanted it to look like an old witch hat. I die cut some stars out of DCWV Glitter Stack and applied those with the Tombow Mono Aqua Glue too. I used some Maya Road rose ribbon, sprayed it with some Hero Arts Silver Spray and attached that with the Aqua Glue too. I have to say I was shocked & pleasantly surprised that I didn't have to fabric glue for that! The back was missing something so I decided to make a paper rose with my Silhouette Cameo and then attach that to the back. This is a home decor piece so I wanted to make sure it looked good from all angles. It was a really quick project and took me only a day to make the entire thing. Usually with Modge Podge I have to wait a day for the paper to dry. The Tombow Mono Aqua is my new "go to" glue for these kinds of projects. 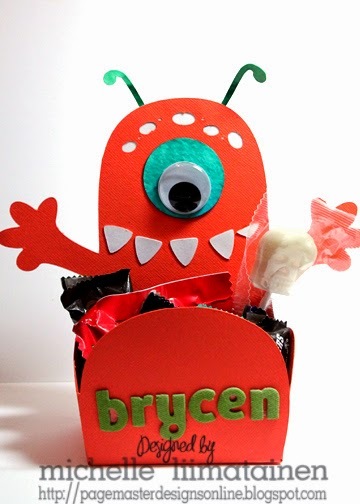 Next up is this cute little monster box that I made for my son. I die cut him with a file from My Scrap Chick and Bazzill cardstock. I used watercolor paper for the eye and used the Tombow Dual Tip Markers to color the eye. I love that these markers are water soluble. I scribbled a little bit of ink on the wet water color paper and then let my waterbrush do the rest. It was so simple to do. 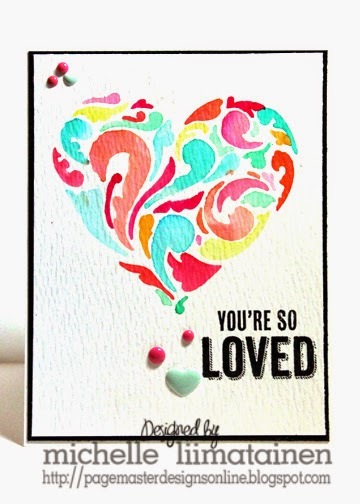 Last but not least I have a card that I created using the Tombow Dual Tip Markers. I have been dying to do this card for a while now. I started with a Hero Arts Die. I die cut some Reynolds Freezer Paper with it and then ironed on the negative space and the heart onto my watercolor paper. The freezer paper has a thin layer of wax on one side. When you iron it onto your paper it seals the edges to that creating and using it as a stencil put a barrier and doesn't let the water bleed through. I took my Tombow Dual Tip Markers and scribbled a little of each color onto a scrap piece of Reynolds Freezer Paper on the wax side. I used a water brush to pick up the color from the markers and place it inside the stencil. I mixed some of the colors for darker tones. I am so in love with the way these markers work with water. I love to watercolor and this technique just takes it to a whole other level. When I pleased with the colors I slightly heated the Reynolds Freezer Paper again with the iron and peeled it off. If some of the freezer paper sticks just put a plain piece of copy paper over it and iron it. It will take it right off. I added a Hero Arts sentiment in black ink, mounted it on black Bazzill and added a few dots. So simple, so fun. Well that is all from me today. 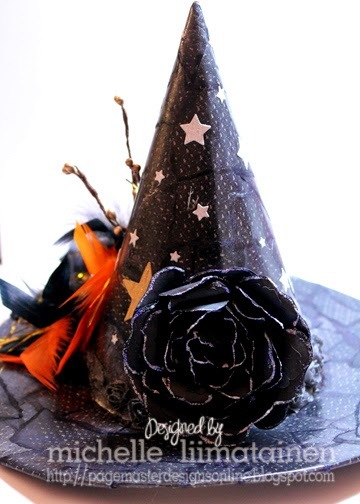 I do hope you will try some of these fun techniques and try these Tombow products. You will not be disappointed. Really FABULOUS projects, Michelle! I am truly in awe of your talent!!! Best of luck with the Tombo DT Finals...you will be such a wonderful asset to the team! Holy wow!! 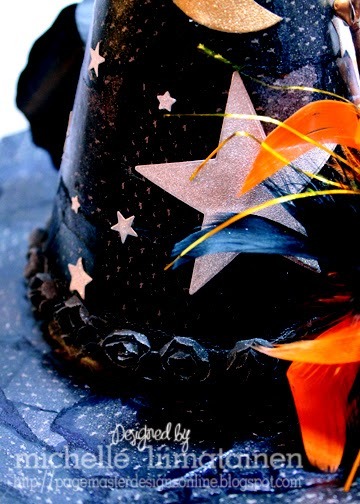 That hat is spectacular!! I mean seriously gorgeous!! I love your tip on the waxpaper too I had no idea!